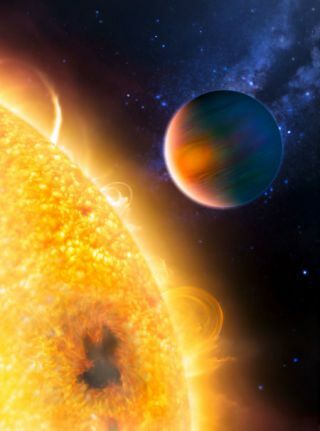 Artist's impression of the Jupiter-sized extrasolar planet HD 189733b, now known to have methane and water. Scientistshave detected the presence of an organic molecule in the atmosphere of anextrasolar planet for the first time, NASA announced today. Thefinding, detailed in the March 20 issue of the journal Nature, marks abreakthrough in the attempt to detect signs of lifeon planets beyond our solar system. Thetell-tale signature of the molecule methane in the atmosphere of theJupiter-sized planet HD 189733b was made by the Hubble Space Telescope's NearInfrared Camera and Multi-Object Spectrometer (NICMOS) in May 2007. MIT's Sara Seager, who was not involved with the study, said that she is "cautiously optimistic that the methane detection is robust" at a press conference announcing the finding. It isthought that under the right circumstances, methane can play a key role inprebiotic chemistry, or the chemical reactions considered necessary to producelife as we know it on Earth. So the Hubble observations of HD 189733b, which is likely too hot to support life, "is a dress rehearsal for future searches for life on more hospitable planets," said study team member Mark Swain of NASA's Jet Propulsion Laboratory in California. Methane, composedof carbon and hydrogen, has beendetected on most planets in our solar system, but never before on a worldorbiting another star. On a smaller, more hospitable planet, methane could be indicative of biological activity, though methane can be produced by non-biological processes. Methane generally breaks up quickly in Earth's atmosphere through chemical reactions; this same process could occur on other small planets. And on a small planet, the hydrogen from the broken-up methane would likely escape quickly to space. So if a high amount of methane is detected on an Earth-sized planet, it could be the result of biological processes, because non-biological processes tend not to produce large amounts of the molecule. Astronomers plan to use the James Webb Telescope to search for water and methane on other extrasolar planets. On Earth, methane is one of the main components of naturalgas and is produced by termites, wetland environments, waste landfills and evenlivestock. It isunlikely that HD 189733b, located 63 light-years away in the constellationVulpecula, harbors life. Although about the size of Jupiter, the planet orbitscloser to its star than the innermost planet in our solar system, Mercury. Thisclose proximity to its sun means the planet's atmosphere swelters at atemperature of about 900 degrees Celsius, the melting point of silver. "Theplanet's atmosphere is far too hot for even the hardiest life to survive ? atleast the kind of life we know from Earth. It's highly unlikely that cows couldsurvive here!" said researcher Giovanna Tinetti of the University CollegeLondon and the European Space Agency. The NICMOSobservations also confirmed the presenceof water molecules in the planet's atmosphere, originally detected byNASA's Spitzer Space Telescope in 2007.